On September 25-28th, the Georgia World Congress Center in Atlanta will be hosting the first ever North American Commercial Vehicle (NACV) Show. Attendees can prepare to see an impressive display of on-highway and vocational trucks from Freightliner (Booth #1612). The Freightliner booth will feature five different new Cascadia® trucks with various cab options, including a 75th Anniversary Truck that pays tribute to Freightliner’s 75 years of innovation, a silver sleeper cab that highlights the latest sleeper features and options, a silver day cab, a bulk hauler Optimaax, and a cutaway cab featuring an extended middle portion to showcase the driver’s lounge/cockpit and optional driver loft. As the leading truck manufacturer in four out of five vocational truck segments, Freightliner will also have a few work trucks on display, all powered by legendary Detroit™ engines, including a DD5™-powered M2 106 upfitted with a Valew service body and electric over hydraulic PTO; a DD8™-powered M2 106 crew cab upfitted with a heavy spec rollback car and equipment carrier; and a DD13®-powered 114SD set-forward axle upfitted with a TBEI/OX aluminum dump body. 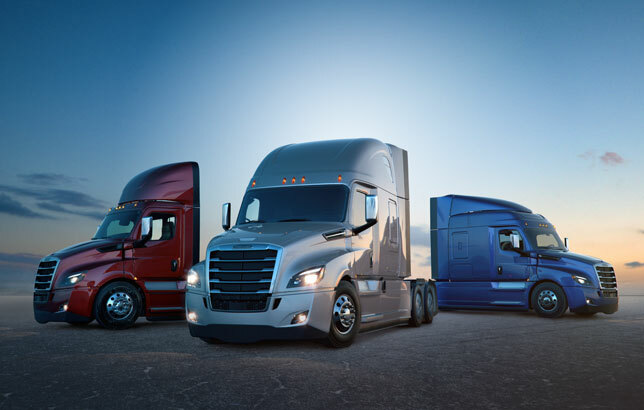 The booth theme that connects all of these trucks is “100% Connected,” which refers to the integrated Detroit engines, powertrains, and telematics, including Detroit Connect and the Detroit Assurance™ suite of safety systems. The inaugural NACV Show is a joint initiative between Newcom U.S.A. and Deutsche Messe. Nearly 400 suppliers will be exhibiting at the show, which will be focused on the needs of fleet executives and decision-makers. The theme of the event is on technology and facilitating business between truck fleets and their suppliers. If you plan on attending NACV, be sure to stop by Freightliner’s booth at #1612.